Runtoberfest starts and finishes at the McMinnville High School track. The 12 and under kids’ mile run will take place on the track just before the 5k starts. The 5k will begin at the McMinnville High School Stadium. New route for 2018: Runners and walkers will do a loop towards downtown 3rd Street and the finish will take place on the track as in years past. Early registration entries (online or by mail) must be received by Oct. 3, 2018. Race category and age must be filled in or you will not be registered accurately. 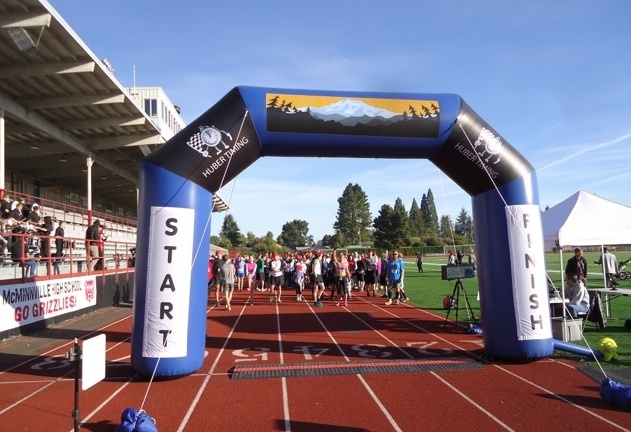 October 6, 2018, 7:30 am at the race start area, Wortman Stadium, McMinnville High School, 615 NE 15th Street. It is a breath of fresh air to participate in a very organized road race. My first 5k in Chicago was paused in a park because we had no idea which path to take. Today was just spot on in terms of planning. From the helpful cross country guides, to the cheerleading encouragement, to the incredible prizes, everything was well-thought-out. Your team has my vote for planning more road races in this area! Thanks. Thanks for a wonderful walk (and run.) We all had great time and can’t wait until next year. I’ve run lots of races in my life and the one that you all just put on is one of the best that I’ve seen. Congratulations on another really great community event.